After the enormous success ofThe Sartorialist, street style photogrpaher Scott Schuman is back with a completely new collection of beautiful images of the men and women who have caught his attention. His much-loved blog, thesartorialist.com, remains one of the most-read in the fashion world and continues to grow in popularity as Scott travels further and more widely. This book emcompasses the diverse style and visual attitude of people as far afield as Japan, Korea, London, Milan, New York, Paris, and beyond. 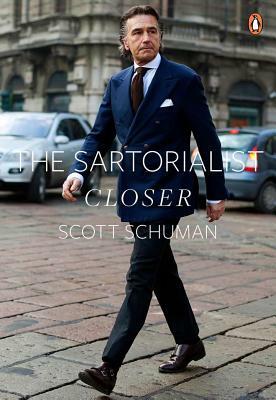 InThe Sartorialist: Closer, Scott Schuman looks deeper and with great breadth at human style, and the way it is expressed across the world. Always reacting to an inspirational moment, the images in his new book continue to reflect Scott's unique sensibility and vision. Available with two different covers: one featuring a woman, the other a man. Scott Schuman started The Sartorialist simply to share photos of people on the street that he thought looked great. The blog now receives more than 14 million page views per month.His work resides in the permanent collections of the Victoria & Albert Museum and the Tokyo Metropolitan Museum of Photography and has been featured in GQ, Vogue Italia, Vogue Paris, and Interview. He lives in New York City with fellow style blogger Garance Dore, with whom he was awarded the CFDA Media Award in 2012."